Cal/OSHA’s storage battery regulations have not been updated in over 30 years, and the regulations do not cover the various battery technologies have been developed since that time. Current regulations address the changing and charging of lead-acid storage batteries and their charging areas but do not address valve-regulated lead-acid batteries (VRLA batteries, commonly referred to as maintenance-free batteries), lithium ion and other modern battery types, which are designed, constructed, utilized, and handled differently than lead-acid batteries. In particular, the use of VRLA batteries, which are low-maintenance sealed lead-acid batteries such as absorbent glass mat batteries and gel cells, has proliferated in California workplaces. VRLA batteries are commonly used in fork lifts, uninterruptible power supplies, emergency lighting, and telecom back-up power supplies. The final rule creates a new Section 5184 in in the General Industry Safety Orders entitled “Storage Battery Systems” (8 CCR 5184), to address stationary battery systems used for standby power, emergency power, or uninterrupted power supplies. Battery systems covered under this regulation will be required to contain approved equipment, devices, and/or procedures to preclude, detect, and control failures. Employers will need to ensure that safety caps on batteries are maintained in proper working order. 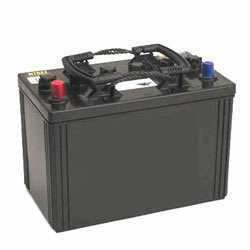 Storage battery systems covered in this section will also be required to meet the applicable requirements of 8 CCR 5185. Precautions for handling electrolyte and corrosive liquids. Protection of charging areas from damage by mobile equipment. Precautions to be taken to prevent open flames, sparks, or electric arcs. Requirements for shower and eyewash facilities. The use of jumper cables and vent caps. The final rule also requires that personal protective equipment (PPE) be provided in accordance with 8 CCR 3380 (Personal Protective Devices) during battery changing and charging operations. Deborah Hunsicker is an STC Senior Analyst and regulatory specialist located in STC's northern Idaho office. She has over 20 years experience in environmental consulting and regulatory compliance. Deb is a recognized expert in federal and state hazardous waste and hazardous materials regulatory issues. She has assisted various legal and industrial clients in developing customized environmental auditing protocols, providing ongoing regulatory monitoring services, and preparing training materials and compliance programs. Currently, she coordinates several regulatory information projects for key clients that involve tracking regulatory developments and preparing monthly summary reports of federal and state regulatory changes that may impact operations. For more information about these or other EPA proposed rules, contact Deb at (208) 255-2780 or dhunsicker@stcenv.com.